Easter Basket Cookies! Use Pre-Made Cookie Dough for these Simple Easter Treats! 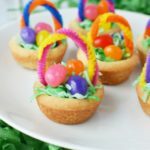 These Easter Basket Cookies are a perfect treat for kids, made with already made sugar cookie dough and candy surprises! Spray a mini muffin tin with cooking spray. Line the inside of the mini cupcake pan with the sugar cookie dough. Press the cookie dough against the sides of the muffin tin, to form your basket shape. Note, it will puff up some during the cooking process. Let it cool, and remove. Toss 1 bag of sweetened shredded coconut with around 4 drops of green food coloring. Fill the inside of the cooled cookie baskets with your green coconut grass. Top with three to four of your favorite kind of jelly beans (or egg shaped candies). If you want to add a handle, you can use a string candy, or pipecleaners cut at about 2 to 3 inches. Simply bend in handle shape, and insert on two sides of cookies.